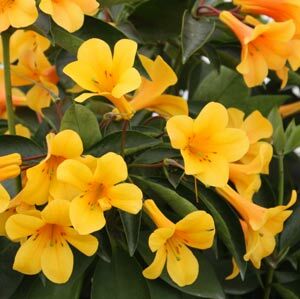 Vireya Rhododendrons, are becoming increasingly popular in landscaping applications for the colorful flowers. More varieties are available from selected wholesale nurseries each year. Often seen as a tropical plant they do in fact grow well as far south as Melbourne and will thrive in a sheltered position in the garden border. Plants that are offered by wholesale growers are usually hybrid forms, grown for bigger and more colorful flowers. Plants are offered in pot sizes from140mm to 200 and 250mm pots depending on growers. Some specialist growers do offer larger specimen plants suited for use by landscapers as well as those looking for ‘instant’ display plants. Rooted cuttings are also offered for on growing, usually by order. Most are small shrubs reaching around 1 – 2m in height. Some are better suited to part shade than others. Excellent in containers and some forms that have a weeping habit can also be grown in hanging baskets. Usually offered for sale by wholesale growers as advanced or semis advanced plants that have reached flowering size, and best sold by garden centres when in flower.